Reporter: "What's the police's excuse going to be?" 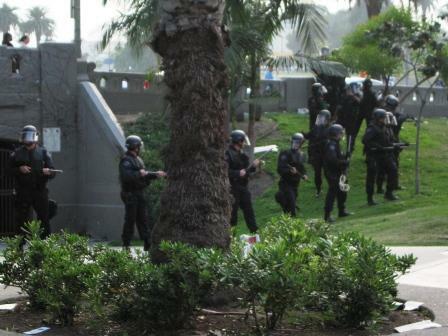 MACARTHUR PARK, May Day 2007--Police stormed a workers' and immigrants' rally at 5:30 p.m. this afternoon in MacArthur Park, sending thousands of families running in terror as they cleared MIWON Immigrant rally and festival with foam and beanbag bullets, batons, and, according to some observers, tear gas. The cops marched through the park in riot gear, indiscriminately clubbing down people in their wake. Young people formed the front line against the onslaught, running in retreat for a few yards at each thud-like explosion and then turning back to the cops, while older and younger people ran through the single open exit in fear that it, too, would be barricaded. A few moments before, children had been playing on the hillside and dancing with puppet dragons. A drum circle was beating out a rhythm, hot dog and shaved ice vendors strolled through the crowd, and speakers at the north end stage called out for solidarity among immigrant and and non-immigrant workers. According to a witness, the melee began when someone in a crowd gathered on Alvarado Street between 7th and 8th Streets hurled something toward the police, as the Aztec danzantes performed for a group gathered on Alvarado. The witness reported that the motorcycle cops nudged the audience, then cops on foot split the crowd in the street and stormed them. A National Lawyers' Guild observer, Sanjukta Paul, was beaten repeatedly, including a blow to the kidneys, as she attempted to separate the police from the crowd. She had demanded that she had the right to be there as she tried to move people off the street, but a cop replied, "No, you don't," then clubbed her with his baton. From inside the park, the first warning was a single thud. Then a line of squad cars, sirens wailing, raced down 6th Street and turned onto S. Park View to 7th Street. Crowds from the street began pouring into the south end of the park, as parents scooped up children from impromptu wrestling matches and pulled them out of trees where they had climbed. Finally a helicopter overheard blared out the dispersal order, telling the crowd to leave the park and return to their cars. Another round of cop cars tore down the crowded street. "I've been in protests in the '50s, the '60s, '70's. I've never seen anything like this," an elderly woman reported. She had been on Alvarado when the cops had charged. The people had lifted the woman over a fence onto private property, where the owner offered her sanctuary. Her daughter, frantically seeking her child as she retreated, was batoned in the stomach three times by a pig who said she wasn't moving back "fast enough." As the police entered the park, vendors at the entrance frantically tried to escape with their carts. Organization members desperately tried to clear tables and literature in the path of the incursion. Roughly eighty pigs formed a diagonal line and marched across the park, sweeping everybody into a shrinking semicircle. The police used foam and bean bag bullets against the people in the park. At least one guy left with blood soaking through his white T-shirt and a massive bruise already forming. Foam bullets carry the impact of a 95 m.p.h. fastball or a baseball bat. Last month, David K. Maxson from McHenry County, Illinois died in a "justified" police shooting with a beanbag gun. IF tear gas was used, a slight breeze wafted much it away, but those in the park felt welling eyes and difficulty breathing. One woman complained that the fracas had triggered an asthma attack. The police arbitrarily fired on and beat those within range. Several reporters were beaten, and at least one was taken in away in an ambulance for a wound to his leg. One white-haired guy reported that his wife had been shot in the chest. A few stray rocks from the park did little to slow the advance of the armed and firing pigs. Someone in the retreating crowd smashed a brick on the sidewalk so that others in front of him could hurl the shards at the police, but no one picked them up. For a few moments some of the ralliers reorganized in a march on 6th Street and stopped traffic, but the cops ordered that they leave the area. The marchers threw the rocks in their hands onto the asphalt in frustration as they left. A number of people circled around the clock and came back down to the park on 6th Street, but the cops kept them at a distance, and a legal observer convinced them to leave the area. By 8:00 p.m. the park was clear, but the Pico Union district was filled with people in the streets, sitting on stoops, and hanging out on street corners. Last year's May Day march also ended with police violence in Alvarado Street. The district was a hot spot during the 1992 Rebellion, and Pico Union is the home of the infamous Rampart Police CRASH unit, which cost the city millions of dollars for lawsuits involving drug dealing, perjured testimony, and framing innocent people. A federal investigation of CRASH was suspended when it was revealed that the FBI was likely complicit in the unit's abuses of immigrants. Listed below are the 10 latest comments of 47 posted about this article.